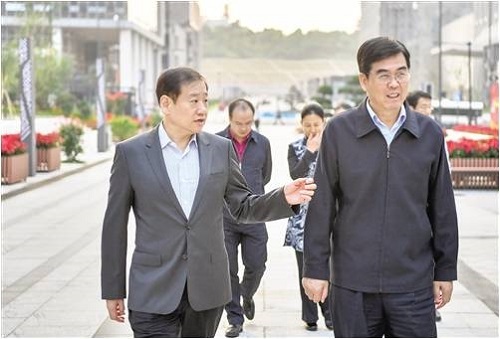 Li Bingjun, Deputy Secretary of CPC Jiangxi Provincial Committee and Secretary of CPC Ganzhou Municipal Committee visited Nanning with his entourage. Specially, he investigated the sites under Nanning's new area planning and construction and ecological environment comprehensive treatment for exchanging development experience and promoting win-win cooperation. Wang Xiaodong, Member of the Standing Committee of the CPC Guangxi Committee and Secretary of CPC Nanning Municipal Committee was present. During the investigation, both sides reached the consensus that Ganzhou of Jiangxi and Nanning of Guangxi should further deepen mutual exchanges, enhance cooperation in new area development, ecological construction, reform and opening up and other areas, jointly give play to their roles as hubs and node cities along the “Belt and Road Initiative”, and achieve mutual and rapid development.